My prediction, based on Bible prophecy, of the events about to take place. Having logged over 5,000 hours studying Bible prophecy, which is a very conservative estimation, I thought it time to make some predictions of what I believe is about to take place. Of course, my predictions are only an educated guess based on my understanding of the Bible and world events. God is revealing more all the time and as He shows me more, I will append this article. Some of my predictions are something you probably have never heard of or even considered before. The reason is because I do not go to old books or commentaries written about eschatology for my information like most eschatology teachers. They were written outside of the end times; therefore, they cannot possibly have any understanding of the world that would then be (Daniel 12:9). Today we do, for we are living in the end times. I go to the Bible to see what is going to happen, then look at the geo-political landscape of today to match up the players. No matter how nonsensical the Bible prophecies may sound at first, the world changes until it lines up perfectly with Bible prophecy. That is the hour we are living in today and why it is much easier to make predictions about what is going to take place in the near future. None of my predictions are absolute, but I think I have some insight that will help you see the end times more clearly. This article is written as a summary of the last article I wrote, “Prophecies of the Antichrist Kingdom – List of 172 Prophecies Concerning the Kingdom of the Beast.” I simply wanted to take all of that information and write it out in a clear chronological order so that it makes sense as a narrative. Please refer to that article for the proof of the statements I make here. After WWII the world was divided into East and West. The definitive example of this was East and West Germany. To the east, Communist U.S.S.R. held power and East Berlin. To the west, “Democratic” Europe held power and West Berlin. Thus, the Berlin Wall was created to separate the two powers and the Cold War began. In 1989 the Berlin Wall fell because Communism in the U.S.S.R. failed and the East and West were once again united. This is the mortal wound of the Beast that was healed (Rev. 13:3). This was the first step in the healing of the divide between East and West. What is about to happen will be a full uniting of Russia with Europe through the United Nations into a one world government known as “The Beast” in Revelation. This is the Tower of Babel version 2.0. The uniting of Russia with Europe may seem ridiculous right now, considering all the tension with Russia and the West over issues like Ukraine and defense missiles, but it is going to happen. The United Nations was formed after WWII to unite the world and prevent war from happening. They have been working behind the scenes to create a one-world government for this noble cause. The major power of the U.N. is the world’s foremost superpower, the United States. However, for some reason the United States will back away from the U.N. and NATO because they are not mentioned as a major player in the kingdom of the antichrist, which is a revised U.N. The major players on the world stage in the end time will be the U.K., the E.U., and Russia. The United Nations will be revised to grab more power after some major terrorist act and world crises takes place. Maybe something like a nuclear weapon being set off in the Middle East by ISIS, which affects oil production and distribution, could be the cause. But predicting what event starts WWIII is impossible, however, it is going to be categorized as a terrorist act by Islam. More importantly, this event, whatever it may be, will move all the nations into their final alignment for the end of the age. For example, the E.U. will further solidify into one entity and become a major member of the U.N., not just an observer member as they are presently. The E.U. will likely become permanent members of the U.N. Security Council. The nations will unite in defeating a common enemy by giving their power to this revised United Nations like never before. NATO will be the primary military of the U.N. with the help of the Russian and Chinese militaries. The United Nations will be different than the one we know today. The Bible says it will only last a short while – 3.5 years (Rev. 17:10; 13:5). It will be formed to prevent terrorism and war but it will in fact be the major belligerent in World War III. It will unite the nations to quell radical Sunni Islam (not Shia Islam because Iran will be with them). The United Nations will need a strong unified military to subdue this threat. The military will be that of the East and West. For the first time since WWII, the militaries of the East, Russia, and the West, Europe, will unite against a common enemy. Before, the common enemy were the Nazis; in the end time, it will be ISIS and other radical Sunni Muslims. Who will be able to make war against such a large unified military as NATO, Russia, and China combined? This war will kill 1/3 of humanity mostly through WMD’s. World War III begins when the unified militaries of the United Nations retaliate to the WMD attack of “radical” Islam. The countries the U.N. will invade are Syria, Iraq, Israel, Saudi Arabia, Egypt, Libya, and Sudan. The U.N. military will fire missile barrages, like the ones we are familiar with during the Gulf Wars. Revelation 8:7 describes it as “hail and fire mingled with blood.” They will fire missiles onto land because 1/3 of the trees of the war area in the Middle East will be burned up. Next, a nuclear bomb will explode in the Mediterranean Sea which is describes as “a great mountain burning with fire was cast into the sea,” Revelation 8:8. Next a dirty nuclear bomb will be set off, likely by ISIS, somewhere in the war area of the Middle East and it will contaminate the fresh water. Revelation 8:10,11 describes this as, “a great star from heaven, burning as it were a lamp, and it fell upon the third part of the rivers, and upon the fountains of waters…and many men died of the waters, because they were made bitter.” All of these nuclear bombs will cause the air to be filled with smoke and dust (Revelation 8:12). Next there will be the release of small demons upon the earth (Revelation 9:1-9:12) which will torment men for five months. The torment, in the natural realm, will be that of nuclear radiation from the WMD’s. That is followed by 200,000,000 larger demons given the power to kill one-third of humanity, namely because of WWIII (Revelation 9:14-9:21.). There is no such thing as a 200,000,000 man army on the way. That number for a human army is not credible and frankly ridiculous. If you were to combine the armies of NATO, Russia, China, and India, you only get 7.6 million. When you read Revelation 9:14-9:21, it is clearly talking about demons in the unseen realm. 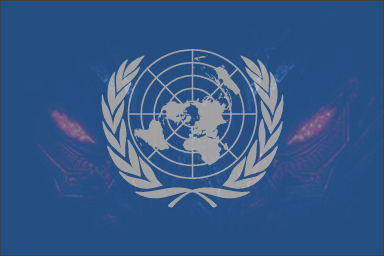 The revised United Nations is the kingdom of the Antichrist and it will be ruled by seven world leaders. They will grant themselves authority over all nations, though it is impossible for them to fully enforce this authority. They will be primarily from the U.K., E.U., and Russia. These seven world leaders will surrender the sovereignty of their respective nations to the revised U.N. for a time to “bring peace”. The man known as the antichrist will be an eighth leader. He will not rule the world by himself, however he will be the chief of the eight. He will have already, behind the scenes, eliminated three leaders. There must be unrest of epidemic proportions for the United Nation’s power grab to be justified. Therefore, men with power, unknown to the world, create the unrest so that they can get more power – world power! They thought they had it with the Arab Spring but it was not enough. ISIS is exactly what the seven rulers of the world need to justify their plan. Behind the scenes they have been giving arms to ISIS, claiming it was given to the rebels of Assad to oust Assad, but in reality, they want ISIS to become a bigger threat so that they can put down their iron fist. The whore of Babylon, a.k.a. Mystery Babylon, is all false religions – those religions other than true biblical Christianity. The whore of Babylon is led by the false prophet (Rev. 20:10; 13:11-18) who is the Pope. The whore will consist of those that join the one-world religion, like Catholicism, false Christianity, and the ecumenicals, plus those that do not, like Islam. The Pope will cause all he can muster to worship the one-world government. It is the Pope that implements the Mark of the Beast system to worship The Beast which is the revised U.N. He will not have the world worship the antichrist man. The eight rulers of the antichrist kingdom will hate those religions that do not join the one-world religion because eight rulers believe they are the cause of war, particularly WWIII when Islam pulls off a major terrorist act. However, the eight rulers will particularly hate the Jews and true Christianity. They will persecute, jail, fine, and even kill religious fundamentalists that do not join the one-world religion and submit to the one-world government, namely Sunni Islam, the Jews, and true Christianity. They will start with Sunni Islam, then when they are done destroying them, they will turn violent against Jews and true Christians. The armies of the antichrist will push from north to south through the Middle East all the way to North Africa fighting ISIS. When the armies of the antichrist are finished with ISIS, they turn back to go home. However, on the way home they will put Israel in its place. Israel will be resisting the two-state solution and the U.N. cannot allow that. So, on the return north through Israel, the armies of the antichrist will slaughter Jews claiming to force them into the two-state solution. However, their interest is not a two-state solution; they want to eradicate all Jews. Two-thirds of Jews in Israel will be killed. Many will flee. Women will be raped in Jerusalem. The antichrist, at the end of the final seven years, will enter into the temple on the Temple Mount and proclaim he is God. This is the Abomination of Desolation. At that time, Jesus returns, raptures His Church and begins His bowls of wrath against the antichrist and his kingdoms. The armies of the antichrist kingdom at Armageddon will be slaughtered by Jesus and His angels so that blood is over 4 feet deep. Some of the armies included in this slaughter are Russia, NATO (Germany, France, Turkey, and U.K.), Iran, and China. Jesus will personally slaughter many “Palestinians” in Jordan as well. After many events, Jesus touches down on the Mount of Olives and enters the Eastern Gate to begin His rule as King of kings and Lord of lords on earth. He will rule the earth with an iron fist for 1,000 years and there will be peace on earth.